Are you obsessed with graphic design and/or can’t stop yourself from doodling? Are you ethusiastic about urban design and how to design cities with people? 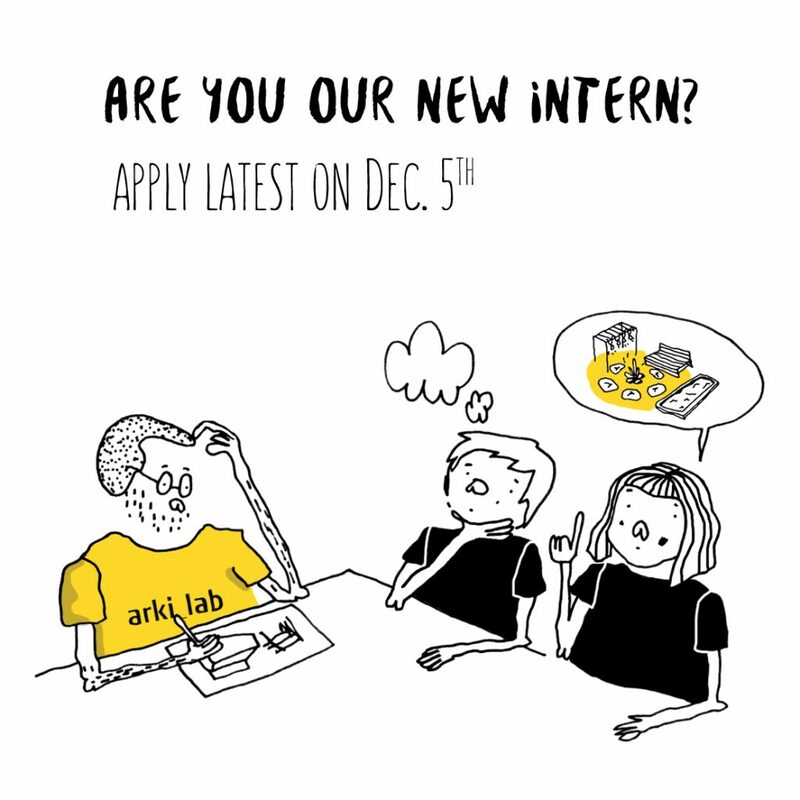 arki_lab is looking for an intern who can be part of our interdisciplinary team for a minimum of 30-37 hours per week, where you get a feel of what all that hands-on work is about. We offer a fun and creative work environment, and the opportunity to experience many aspects of working in a small, fast-paced design studio in the heart of Nørrebro. You´ll experience a flat structure, where you are the driver of your own projects, but with competent feedback to ensure that you learn and grow throughout the internship. Help us to deliver visually rich and compelling content to our clients as well as to our general audience. Convert ideas and concepts into visuals. Make sure to keep our website dynamic and attractive through contributing new images and graphics. Contribute to competitions, fondsapplications and presentations in close collaboration with other members of the team. Are able to be here in the spring semester 2017 in about 3-6 months – starting from January. Are a dedicated and independent student, who is passionate about communicating co-creation and urban design. Have a basic knowledge of Illustrator, Photoshop and InDesign. Are able to think creatively within the bounds of a company. It´s a great plus if you have experience working in wordpress and if you are an enthusiast illustrator, but not a demand. 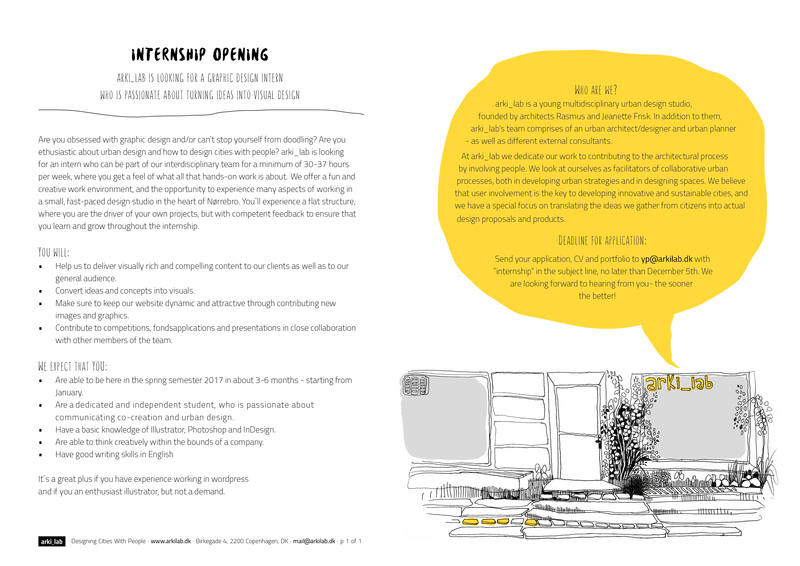 arki_lab is a young multidisciplinary urban design studio, founded by architects Rasmus and Jeanette Frisk. In addition to them, arki_lab’s team comprises of an urban architect/designer and urban planner – as well as different external consultants. At arki_lab we dedicate our work to contributing to the architectural process by involving people. We look at ourselves as facilitators of collaborative urban processes, both in developing urban strategies and in designing spaces. We believe that user involvement is the key to developing innovative and sustainable cities, and we have a special focus on translating the ideas we gather from citizens into actual design proposals and products. Send your application, CV and portfolio to yp@arkilab.dk with ”internship” in the subject line, no later than December 5th. We are looking forward to hearing from you – the sooner the better!